Use promo code BOWERY50 to Save $50 off your mattress purchase! 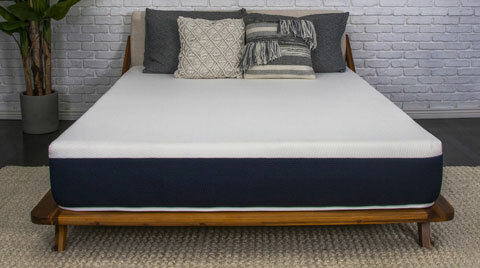 The Brooklyn Bowery is the latest addition to Brooklyn Bedding’s rapidly growing line of quality mattresses. The Bowery is made from hyper-responsive Energex technology. This high tech proprietary foam offers great support and sleeps cool. This mattress was designed to fill a void currently in the market for a “quality” spring free mattress at a value price-point. Brooklyn Bedding is one of the few online companies to produce mattresses in their own factory. Every step of the process from conception to final production takes place at their Phoenix, AR facility. Nothing is outsourced and the middle man has been removed. This allows Brooklyn Bedding to pass along the savings direct to consumers. Brooklyn Bedding’s Bowery mattress is an affordable alternative to memory foam. The Cover: This premium woven fabric is breathable and sleeps cool. The Bowery’s cover is smooth, soft and comfortable. 3″ of Energex foam infused with cooling gel. Contouring and pressure relieving, Energex is more responsive than Memory Foam. It bounces back quicker and allows for for easier movement with low motion transference. 2″ of Transition Foam eases your body into the firmer base layer. This layer is essential to the Bowery’s comfort. Like the name implies, Transition Foam, transitions to the denser core below. 5″ of dense Support Foam provides additional structure and stability. The core is durable and adds to the Bowery’s longevity. More responsive than memory foam, the Energex foam is both contouring and pressure relieving. Energex foam should provide limited motion transfer. Less sleep disturbance is great for couples. Energex foam has more buoyancy and bounce than most synthetic foams. This allows for greater ease of movement. The breathable top layers of this bed limits heat retention. All Brooklyn Bedding foams are CertiPURE Certified to not emit dangerous toxins into the air. The Bowery uses no chemical fire retardants. Instead, natural silica is used to obtain fire safety standards. Only mild odors that quickly dissipate have been reported. Don’t expect the same durability as the Brooklyn Signature or Aurora hybrids. However, the Bowery compares favorably to many other mattresses in its price range. Brooklyn Bedding’s spring-less mattresses tend to perform better in this area than similar spring-less beds we’ve tried. However, edge support will still not match that of a coil unit. We recommend considering the Brooklyn Signature or Aurora if edge support is a concern. We found these mattresses to have an exceptional edge to edge feel. Ten Year Warranty: The Bowery, like all Brooklyn Bedding mattresses, comes with a ten year warranty. What's particularly impressive about this coverage is that any mattress with over 1" indentation is considered a defect and covered by this warranty. The industry standard most companies abide by is 1.5". Energex foam allows for easier movement than memory foam. Solid value within its price range. Although no single mattress is right for everyone, the Bowery is designed to accommodate the widest range of comfort preferences. It’s firm enough for most back and stomach sleepers and soft enough for most side sleepers. The premise behind any spring free mattress is to provide support and alignment without creating pressure points. How comfortable you will be on your back will depend on personal preference and weight. Those looking for a medium, more conforming feel will appreciate the Bowery. Some back sleepers prefer a firmer more structured feel than what this bed will offer. Keep in mind, firmness perception varies depending on your size and physical condition. A larger person will be absorbed into the mattress more and perceive this bed as being softer. In this position it’s imperative to have enough pressure relief for your shoulders and hips. This medium firmness level is ideal for most but not all side sleepers. Those seeking a super soft mattress with deep body hug should choose another option. Stomach sleepers need a mattress that is firm enough to prevent the lower back from dipping and causing lower lumbar pain. The Bowery should suffice for most who choose this position. Keep in mind larger body types will sink deeper into a mattress and may require a firmer, more supportive bed. If you are looking for a foam mattress that offers exceptional value, we strongly recommend the Brooklyn Bowery. This mattress is priced well below comparable beds. More responsive than memory foam: Energex foam is relieves pressure but responds quickly. This allows for greater ease of movement. Sleeps Cool: Energex with cooling gel is breathable and limits heat retention. Limited Comfort Options: The Bowery's is made in a medium firmness that will accommodate most but not all comfort preferences. If you are looking for a very soft or very firm mattress, you will need to look elsewhere. Larger individuals may not find enough support. Those seeking a medium firmness will like the Brooklyn Bowery. It has a not too soft but not too hard feel that appeals to a wide variety of sleep positions. Couples who differ in firmness preference may find this mattress a nice compromise. If you want to sleep cool, this mattress is more breathable and less heat retentive than memory foam. Shoppers in search of a great value will appreciate this mattress. The Bowery offers solid support and comfort at an affordable price. Those seeking a very firm or very soft mattress will likely gravitate towards other option. This mattress is designed to accommodate those seeking a medium firmness level. After removing the mattress from it’s box, place it on it’s foundation for easier setup. Carefully cut through the protective plastic. Once the vacuum seal is broken, your mattress will expand quickly. However, It will still need time to decompress and aerate. Typically, it should be ready to sleep on within an hour or two. The Brooklyn Bowery is a solid entry level mattress at a great price. Energex foam offers significant support, cooling and comfort. At $649 for a queen, the Bowery is priced hundreds of dollars below Casper, Leesa and Purple. More importantly, it’s manufactured by Brooklyn Bedding; one of the most respected mattress companies in the industry. These mattresses are built at Brooklyn Bedding’s own factory and delivered direct to you with absolutely no risk. If not totally satisfied, return it for full refund. For those on a budget, we feel the Bowery is a can’t lose mattress option.